Dr. Vikas Bhardwaj is a Neuro Surgeon at Promhex Multi-Specialty Hospital with an experience of more than 10 years. Dr. Vikas Bhardwaj did his MBBS from Lala Lajpar Rai Medical College in 2002. He did MS from Lala Lajpar Rai Medical College in 2008 and His M.Ch.was in Neuro Science from KGMU in 2012.He is proficient in treating brain, spinal cord, and nerve disorders through his gifted expertise in Neurosurgery. He demonstrates high order skills in handling brain tumors and micro-neurosurgical interventions coupled with a competency in spinal surgeries including spinal instrumentation of cervical, dorsal & lumbar region and spinal tumors. 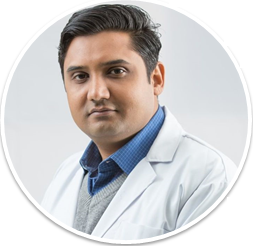 Besides having an extensive experience in endoscopic surgeries and hydrocephalus management, Dr. Bhardwaj exudes immense dexterity in the management of all types of head injuries such as E.D.H, Acute subdural hematoma, brain contusions, compound depressed fractures and base of skull repairs. Awarded 1st prize in UP Neurocon 2012 in Award Paper category. MS Thesis: 'Comparision of herniorraphy and hernioplasty in terms of outcome and complications' submitted to CCM University, Meerut. MCh Thesis: 'Utility assessment of DW MRI in brain abscess management' submitted to KGMU, Lucknow. Published paper in American Journal of Neuroradiology 2011- Apparent diffusion coefficient with higher b values correlates better with viable cell count, quantified from the cavity of brain abscess. Paper presented in NSI, Bengaluru in 2011. Paper in process of publication: Role of DWMRI in Management of Brain Abscess. Paper Presentation (Management of Posterior Fossa Abscess with Burr Hole and Aspiration: A case series) in NSI Conference Delhi, December 2012. Paper in process of publication: Management of post. Fossa abscess- excision vs aspiration. Neurological Society of India (NSI). Neurosurgical Society of India (NSSI). World Federation of Neurosurgeons (WFNS).